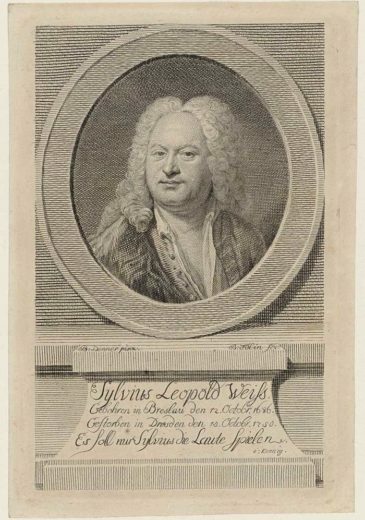 Silvius Leopold Weiss was probably the greatest composer of lute music in history, ranking with Francesco da Milano and John Dowland, the two outstanding figures of the Renaissance lute. Weiss certainly was the most technically accomplished lutenist of the 18th century. S.L. Weiss was born in 1687 in Grottkau, today known as Grodkow, Poland. He grew up in a family of lute players. His father, a professional lutenist, initiated him, his younger brother and his sister into the secrets of the lute and the theorbo. At the age of 21 he accompanied Poland’s Prince Alexander Sobiesky to Rome where he met the Scarlatti father and son. Ten years later he returned to Germany and served at the Court of Prince August the Strong, who at the time was King of Poland and residing in Dresden. As a chamber musician Weiss was highly appreciated and in the last years of his life he was the best-paid instrumentalist at the Dresden Court. In Dresden, Weiss became a close friend of Wilhelm Friedemann Bach, the eldest son of Joh. Seb. Bach. With Wilhelm Friedemann, Weiss visited Leipzig where he met J.S. Bach in 1739. From reports of Johann Elias Bach, J.S. Bach’s personal secretary, a friendship developed between the two. And on at least one occasion the two grand masters played together and may have challenged each other to improvise on given themes. Weiss has created a massive musical oeuvre, mainly for solo lute. From his hand, more than 660 pieces have come down to us in a variety of tablature manuscripts (a notation system completely different from the standard system of today). Most of the works are grouped into ‘suonatas,’ a term used by Weiss. Essentially, these sonatas are suites or partitas in French style, consisting of a number (5-6) of Baroque dance movements in a certain fixed order. There are two principal sources of the music of Weiss. The first is a manuscript at the British Library in London, probably compiled in Prague between 1717 and 1725. The second is a set of six manuscript volumes in the Sächsisches Landesbibliothek in Dresden, assembled during the life of Weiss and shortly after Weiss’s death in 1750 from diverse sources. Both sources comprise together some 360 pieces of tablature. The remaining 300 pieces can be found in music libraries all over the world. In 2015 I have transcribed and arranged a new series of eight lute sonatas, which are publlshed by Metropolis Music Publishers. Five sonatas are from Dresden and three are from London sources. In addition 4 Sonatas are brought out by me and can be downloaded from this website: Sonata WSW 34 (Dresden), Sonata WSW 21 (Dresden), Sonata WSW 42 (Dresden), Sonata WSW 37 (Dresden).